Form 16 is your salary TDS certificate. If your income from salary for the financial year is more than the basic exemption limit of Rs 2,50,000 your employer is required by the Income Tax Act to deduct TDS on your salary and deposit it with the government. If you have also disclosed your income from other heads to your employer, he will consider your total income for TDS deduction. If your income is below the basic exemption limit your employer will not deduct any TDS and may not issue you this form. If you have worked with more than one employer during the year, you will have more than one Form 16. This Form 16 is a certificate, where the employer is certifying details regarding the salary you have earned during the year and how much TDS has been deducted. It has two parts, Part A and Part B. Part A has information of the employer & employee, like name & address, PAN and TAN details, period of employment, details of TDS deducted & deposited with the government. Part B includes details of salary paid, other incomes, deductions allowed, tax payable etc. 2. What is Form 16A? Form 16A is also a TDS Certificate. While Form 16 is for only salary income, Form 16A is applicable for TDS on Income Other than Salary. For example – a Form 16A shall be issued to you when a bank deducts TDS on your interest income from fixed deposits, for TDS deducted on insurance commission, for TDS deducted on your rent receipts, in fact, when TDS is deducted on any other income you receive that is liable for such deduction. This certificate also has details of the name and address of deductor/deductee, PAN/TAN details, challan details of TDS deposited. It also has details of income you have earned and the TDS deducted and deposited on such income. All details that are there in Form 16A are available on Form 26AS. This can be used to file your return. But the same is not in case of Form 16. 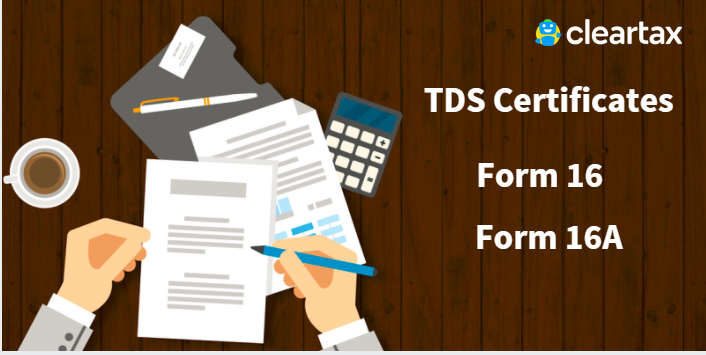 Details of Form 16 that are available in Form 26AS is only TDS deducted by the employer. Both the forms are important and are required to help you file your return smoothly. You can also verify the income details and how much TDS has been deducted and at what rates.